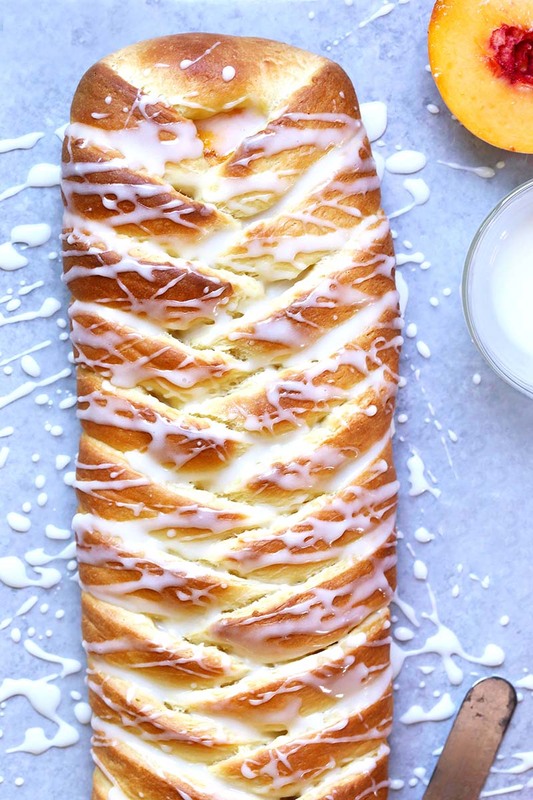 Filled with sweetened cream cheese and slices of sweet peaches, this peach Danish braid bakes up beautifully bronzed. Add a sweet almond drizzle for a scrumptious finish! in a medium bowl; cover loosely with plastic wrap and let stand 15 minutes. cups (280 g) flour and mix in at low speed until a soft dough forms, about 2 to 3 minutes. indentations remain, dough has risen enough. both sides of dough (be careful not to cut parchment paper). with plastic and let rise 25 minutes. Just curious… do you think this could be done with almond flour and swerve as a sugar substitute? Hi Victoria – This recipe was developed using all-purpose flour, which contains gluten. Because almond flour doesn’t contain gluten, it would not work with a one-to-one substitution in this recipe. You can browse our gluten-free recipes here >> https://redstaryeast.com/recipes/gluten-free-recipes/.